In Ang Larawan, her first feature film, West End sensation Joanna Ampil plays Candida, the strong-headed woman who keeps together a façade of respectability in the crumbling Marasigan household. Now marking its second week in cinemas today as part of the 43rd Metro Manila Film Festival, Ang Larawan had a rough start. On the second day of its release, many movie theaters pulled it out, presumably because it didn’t make a killing in the box office. But this to me felt curious, as the cinema where I saw it on its second day was jam-packed. The audience, evidently in love with the film, broke into an applause when the credits rolled —an event that was replicated in the different theaters still playing it. Just like its admonishment of “contra mundum” (going against the world), the film, pitted against the sure-fire blockbuster hits, proved to be the dark horse as it walked away with the festival’s Best Picture, among other awards, which generated attention and boosted its prestige. Produced by Culturtrain Musicat Production, Ang Larawan may have been the David to the Goliaths of major studios, but it is brimming with talent. Based on the Nick Joaquin classic, Portrait of an Artist as Filipino, the film combines excellent casting, soaring lyricism, and stunning visuals, making a claim as the play’s definitive film adaptation for today’s generation. Director Loy Arcenas (Niño and Requieme! ), who worked with the libretto of National Artist Rolando Tinio and the composition of Ryan Cayabyab for the musical when it premiered for the stage at the Cultural Center of the Philippines, has stepped up to the plate by at once preserving the narrative integrity of the drama and introducing a contemporary freshness to a story that revolves around the conflicting passions between the heart and the mind, between art and life, between individual happiness and familial bond. This update is largely based on the casting of Rachel Alejandro and Joanna Ampil who give new face — not to mention new vocals — to Paula and Candida, respectively. With Intramuros in the encroaching shadows of World War II as backdrop, the unwed sisters navigate their family’s fall from grace when their father, the once-illustrious painter, Don Lorenzo Marasigan, is taken ill and has lost his passion for his craft. The casting of the Urian Best Actor Paulo Avelino as the swaggering Tony Javier — a vaudeville pianist, the boarder in the house of the Marasigans, the seducer of women — was a good decision, as his matinee idol looks provide a marvelous contrast to the eventual breakdown of the character. 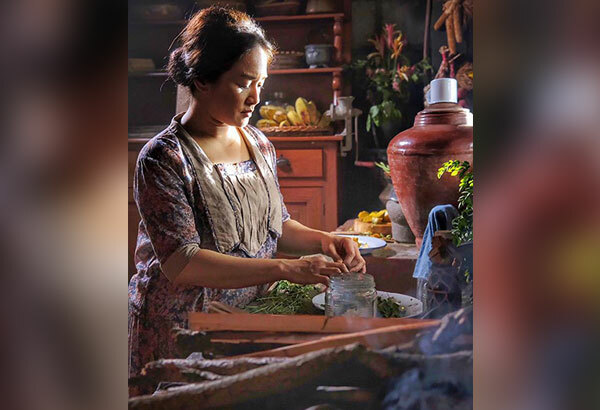 A well-known theater actress in the West End, Ampil, who won the festival’s Best Actress, has proven to be this film’s revelation as she was able to capture the pathos of the near-destitute spinster trying hard to protect the glory of the family’s crumbling name and household. Her singing, which is as crisp as it is evocative, is inflected with all the devastating emotions connected with her slow, but inevitable, crisis of character and reckoning of faith. Alejandro, on the other, has infused subtlety and restraint to Paula without losing the simmering passion of the character. Joining Alejandro, Ampil and Avelino is a stellar ensemble from the worlds of OPM, film and theater: Celeste Legaspi, Dulce, Nanette Inventor, Robert Arevalo, Nonie Buencamino, Menchu Lauchengco-Yulo, Noel Trinidad, Jaime Fabregas, Leo Rialp, Bernardo Bernardo, Sandino Martin, Aicelle Santos, Cris Villonco, Cara Manglapus, Jojit Lorenzo, and Rayver Cruz. OPM icons Ogie Alcasid and Zsa Zsa Padilla also make an important cameo. The story opens when a long-time family friend and journalist Bitoy Camacho (Martin) pays a visit to the sisters to write about the last work painted by Don Marasigan, who is said to be a contemporary of Juan Luna. Titled “Portrait of the Filipino,” the painting features Eneas carrying his father Ankises out of the burning city of Troy. It is the silent, unmoving protagonist of the film, which kick-starts the dramatic action of the play. The painting, as the play states, depicts how a nation carries its own conscience. It may also be seen as an allegory of how the young reconcile the burden of the past with the present claims of identity and selfhood. Troy, in this context, is the burning heap of history, which, in the context of the play, prefigures the ruins that will become of Manila after World War II. Freighted with the rich associations of our colonial history and our possibility as an independent nation, it is the most powerful painting in Philippine fiction. From the auspicious visit of Bitoy, other characters follow suit, with each having their own idea of how the painting can be disposed of, in the guise of helping the sisters out of their misery. These include their successful brother Manolo (Buencamino) and sister Pepang (Lauchengco-Yulo) who have lost their affinity to their old life; and Don Perico (Arevalo), a once a romantic poet but now an officious senator, who wants the sisters to donate the painting to government in exchange for a lump sum. Each entreaty gets rebuked, until the crucial moment in which Paula, once and for all, decides on the fate of the Marasigan masterpiece. A highlight of the film is the recreation of the La Naval procession as the sisters conduct their last tertulia, a party given by families from high society, in the crumbling house as World War II rears its ugly head. Gino Gonzales, who won Best in Production Design, consulted historical records and old photographs in order to depict the grandeur of the procession when it was still held in the Walled City before moving to and becoming the most important religious event in Quezon City. Adding a touch of authenticity is the original icon of the Virgin of La Naval, aglow with golden light, used in the scene. Rated “A” by the Cinema Evaluation Board (the only film that has achieved this distinction among the festival entries), Ang Larawan is a moving portrait of a family — and the nation — as it grapples with frailties, hardships and assaults to the old tradition. How does one reckon with the weight of history and memory against the pressing demands of present-day reality? How does one contend with private passion against familial devotion? How does one go against the world? What is the value of art? Ang Larawan is an eloquent love letter that seeks to answer those questions.